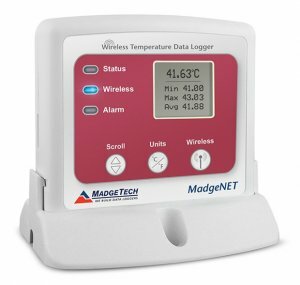 The RFTemp2000A is a wireless data logger featuring a digital display. The device measures ambient temperatures, making it ideal for monitoring perishable goods, chemicals and more. Starting, stopping and downloading from the device are all performed wirelessly using the RFC1000 wireless transceiver, allowing the user to spend less time maintaining the data logger. Data can be provided in real time back to a central PC, or the device may be downloaded at periodic intervals. The convenient digital display provides the current reading as well as minimum, maximum and average statistics for a convenient snap shot of the logged data. For instant, out of range notification, an audible buzzer as well as LED alarm indicator notifies users when the temperature is above or below the user specified alarm setting. Through the software, email and text message alarms can also be sent. The RFTemp2000A also features programmable trigger settings for applications in which temperature logging is critical only above or below certain temperatures. 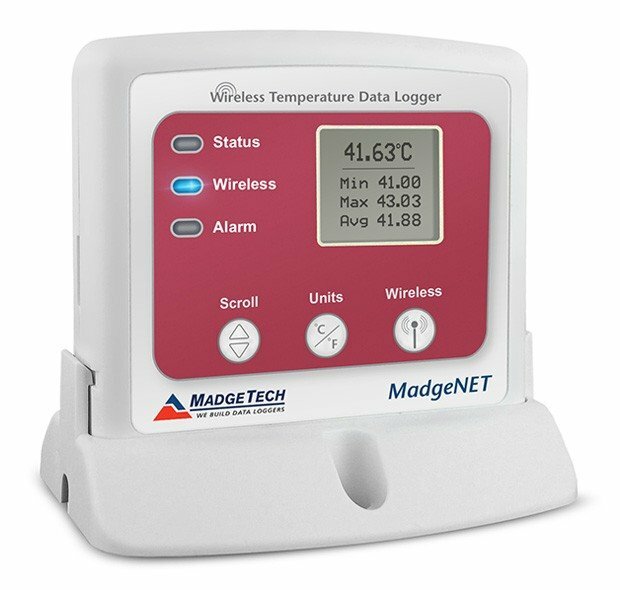 This information may be programmed into the device, and the data logger will only begin to log data to memory, once the temperature limit has been exceeded. The RFTemp2000A can be used as a single, wireless data logging system, yet can be expanded to a large scale system, which can include hundreds of data loggers measuring a number of areas (additional MadgeTech wireless loggers and transceivers may be required). The RFTemp2000A utilizes the new MadgeTech 4.0 Software. Data can be viewed in graphical or tabular formats and summary and statistics views are available for further analysis. The software features export to Excel®, data annotation, digital calibration and more.